NZ females donned solidarity hijabs, Maori bikers converted to Islam and the journaille went on a self-flagellating frenzy that was nothing short of a shiite ashura. 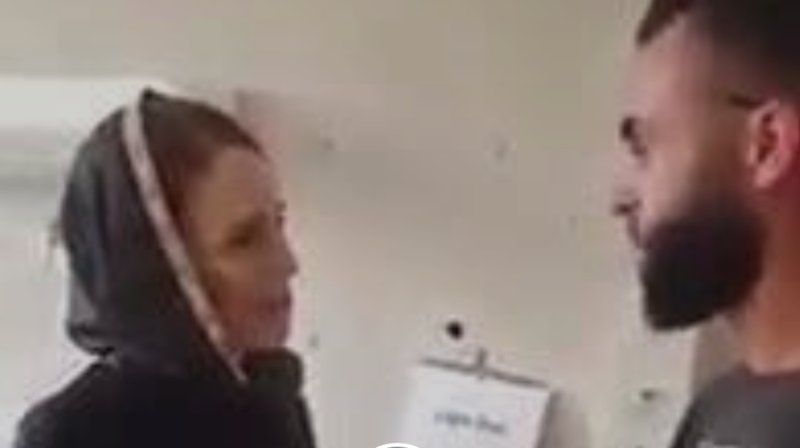 The Prime Minister of New Zealand donned a hijab. And she had plenty of company among (stupid) Kiwi females. … one New Zealand book chain has pulled the best-selling book 12 Rules for Life by Jordan Peterson simply because he dared to pose with some fan who had a t-shirt on which was critical of Islam. We see you now, Adern. We know who and what you are. 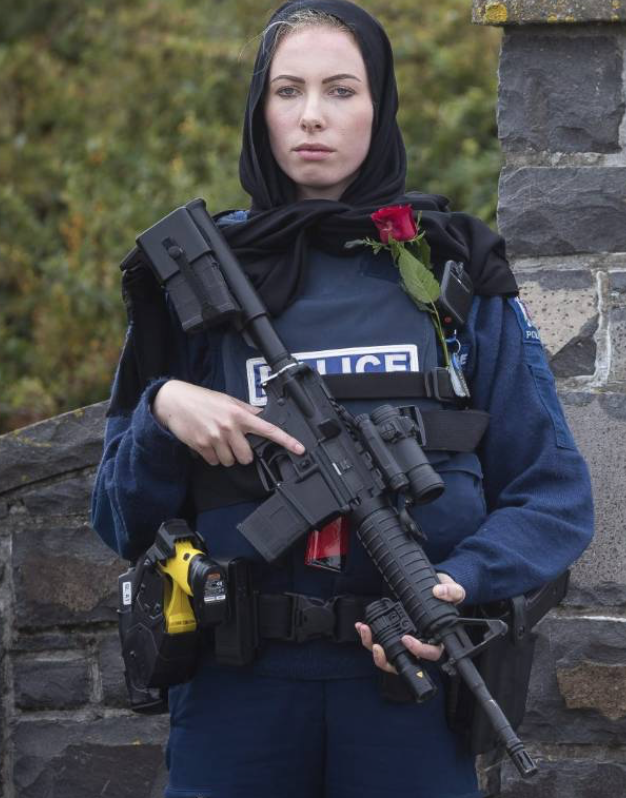 Comments include: “This image so strikingly captures NZ’s example of tolerance, compassion and humanity, and should be seen as far and wide possible.” And “this photo is so incredible, beautiful and powerful”. Were we in an acknowledged war, what Brenton Tarrant has done, murdering indiscriminately including small children, would be a war crime. As it is it’s the crime of mass murder and once convicted after a fair trial he must be punished properly according to the law of New Zealand. But while the relatives of the murdered worshippers grieve it is obvious that the wider Muslim community, in this most liberal of English speaking Commonwealth countries, are seizing the opportunity to reach out with some subtle and not so subtle dawa or proselytization. Towards women we have tomorrow’s effort: Stand with Muslim women: Wear a headscarf as an offering of support. All women are being encouraged to wear head scarves tomorrow to show their support for the Muslim community. The nationwide event is all about making Muslims in New Zealand feel safe. Some are unsure whether it’s culturally appropriate and what colours to wear. Newshub spoke to Amina Patel, a Muslim businesswoman and mother. Patel’s hijab is elaborate and has a bonnet, pins and accessories, bus she says just draping a scarf over your head tomorrow is enough. Any colour but red is fine to wear tomorrow, and if you’re in Auckland and want some help putting it on, call in to the Ponsonby Mosque from 4pm and volunteers will give you a hand. Wearing a head scarf may feel strange or uncomfortable for some, but some Muslims said that’s also part of what it takes to understand what it’s like to walk in their shoes. A top Auckland girls’ school says the hijab is not allowed under their uniform code, but will support students who want to wear one for the ‘Scarves in Solidarity’ event on Friday. Diocesan School for Girls is an Anglican school based in Epsom, Auckland, which costs upwards of $19,000 per year in school fees for each student. At Timaru Hospital the initiative is being organised by a doctor. It is called Headscarves for Harmony and this photograph shows the staff already wearing their head coverings IN ADVANCE. Have many nurses and radiographers, knowing the oppression around the hijab in other countries refused? How much moral pressure would be exerted to show ‘solidarity’ after such a heinous crime of mass murder? How could you refuse? A bit more worrying is the outreach between the mosques and the biker gangs, many of whom are Maori and Polynesian. On the surface it looks great. In principle I expect it has started with good intentions. The gangs are tough and manly. The Maoris had a warrior culture. Protecting fellow citizens while they pray is a Good Thing. But when dawa begins…. The white Europeans came to your country… they came to ours… our religion is not the white man’s… it could be yours…. Just as happened with African Americans and Nation of Islam, and elsewhere. …a handful of biker groups that have reached out to the country’s small Muslim community to express solidarity in the aftermath of the massacre, according to The New Zealand Herald, and offered to provide voluntary security at mosques during this week’s jumah, or Friday prayers. Groups that have promised protection include the Mongrel Mob, Black Power, King Cobras and Hells Angels. “We will support and assist our Muslim brothers and sisters for however long they need us,” Fatu told the New Zealand news outlet Stuff. Although the Muslim community did not feel scared, Mohsin said, the support was appreciated. Picture below. Mongrel Mob Waikato president Sonny Fatu with Hanad Ibrahim from Jamia Masjid Mosque in Hamilton. Jihadist Mark Taylor who is currently in a Kurdish prison after his escapades with ISIS is from Hamilton and ’embraced Islam’ there. I have no information as to where he was radicalised. The announcement by Prime Minister Jacinda Ardern successfully balances the tension between making New Zealand safer, and the legitimate concerns of the rural community. 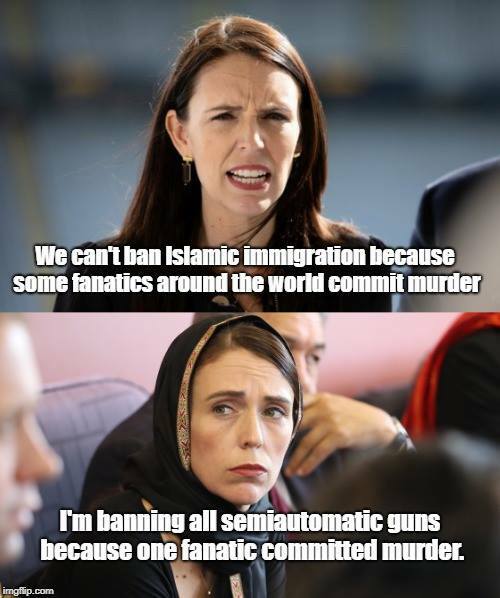 By instantly changing the Arms Act to reclassify any semi-automatic with a calibre greater than .22 as MSSA firearms, weapons such as the AR-15 now require E-category licences. These licence endorsements are much more difficult to obtain. Semi-automatic shotguns capable of using detachable magazines with more than five cartridges also fall into this category. The instant classification means there can be no stockpiling of AR-15s, or similar, before all MSSAs are totally banned in a few weeks’ time. This is a sensible move. Nearly all of my friends and family I’ve spoken to this week had no idea of the incredible firepower easily available over the counter in our country. None will be worried about a ban. All asked why it’s taken so long. Thousands from across New Zealand are expected to come to Christchurch’s Hagley Park for a call to prayer and two minutes of silence one week after 50 people were killed in a terrorist attack. Friday’s service will start with the call to prayer, which will be broadcast nationally across all major free-to-air TV and radio stations. The Muslim Call to Prayer for the Friday congregational prayer, the Jumu’ah, will be broadcast at 1.30pm, and will be followed by a two-minute silence at 1.32pm, at Hagley Park, opposite the Masjid Al Noor in Deans Ave.
TVNZ and RNZ will broadcast the call, and MediaWorks has confirmed it will follow suit on television station Three and radio station Magic Talk. NZME will also broadcast it on Newstalk ZB. … The Muslim community will then pray from 1.34pm until about 2pm, with the crowd asked to remain silent. The event will end with a brief closing remark from Ardern (left) about 2.02pm. He told TVNZ1’s Breakfast it’s important to learn about the types of prayers and the food Muslim people can eat for people wanting to provide meals. Mr Harith also said Muslims will only take and consume halal food. Mr Harith said if you’re going to donate food seafood and vegetables are halal and most desserts are fine. He said he doesn’t think there’s any real danger of offending anyone. I have always had a lot of respect for New Zealanders and Australians. There was a time when they were indistinguishable to the English eye, both our cousins, they sounded similar and were not Canadians. But in recent years the difference is more pronounced. New Zealanders are very liberal. Australians, perhaps because they have had Islamic terrorism in their streets, or a more up front militancy among their Muslims, seem more aware, less inclined to accept the soft soap. I know the Kiwis are so well-meaning. They breed sheep, delicious sheep, which I can no longer purchase in the UK as it is all slaughtered halal compliant for their middle eastern/Malaysian market. I don’t like to see them walking like sheep into a halal dawa fest, with their good nature and friendly outreach being taken advantage of. I think one positive thing islam does is to force all such criminals (politicians, police, media, bikers) to become more openly honest about their own inherent criminality. It emboldens them to come out of the civilized closet and proudly reveal their truly barbarous, savage natures to the world.